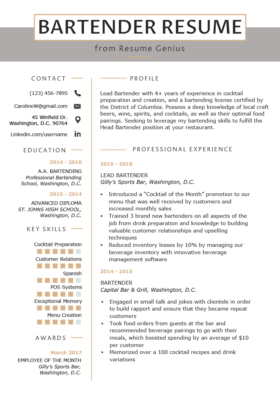 We’ve plated an incredible server resume example for you to download and customize for free. Check out our server resume writing tips to get a leg up on the competition. Server with 7+ years of experience in food preparation and service, and a certificate in Food Handling and Safety. Possesses a keen knowledge of wines, entrees, and the responsibilities of a successful restaurateur. 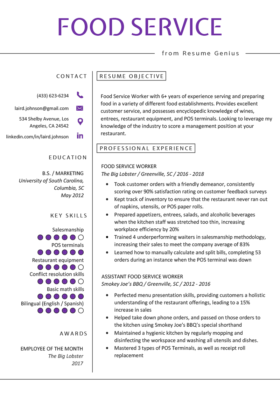 Aiming to leverage my knowledge to effectively perform a server position at your restaurant. Cleaned all work areas, equipment, utensils, dishes, and silverware, and ensured they are stored appropriately in accordance to state law. A professional server serving wine. Read this resume writing guide to ensure you achieve your goals. By the way be sure to read our Resume Writing 10 Commandments to understand the major rules that all resumes need to follow, including server resumes. If this seems difficult, you can always create a server resume in minutes with our widely praised resume maker. Be sure to include these key server skills on your resume. Need more skills ideas? We have an in depth guide about writing the skills section here. Keep in mind that if you have any certifications, such as a Certification in Food Handling and Safety, you should place it at the top of your resume. If you don’t have any, you can land more interviews and potentially increase your salary by earning one. The National Restaurant Association offers certifications here. The first major section of your resume is called the Career Objective. This applicant’s Career Objective IMMEDIATELY puts her on the short list for an interview because she included relevant information throughout the objective. Certificate in Food Handling and Safety. 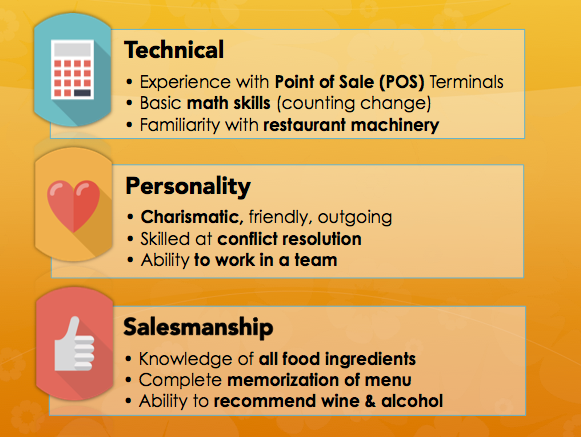 Keen knowledge of wines, entrees, and the responsibilities of a successful restauranteur. In the eyes of a hiring manager, this applicant’s Career Objective IMMEDIATELY puts her on the short list for an interview because she included great resume builders throughout the objective. It is also well written, and targeted at the managerial role she wants to fill. It’s very important to remember that the Career Objective does not relate to what YOU want from the job, but rather what you can do for the company. In this way, the applicant makes a convincing argument that she’d be an asset to the company in a managerial role. Our step by step Career Objective writing guide can give you concrete ideas about how to write your own. Adding numbers to your job description bullet points will help the hiring manager grasp the size and scope of your responsibilities, and give them a clearer mental picture of your experience. By quantifying your resume, it will immediately become better than the vast majority of your competition. Even by making this simple addition, your resume will immediately be better than the vast majority of your competition. Do you know how much you make in sales daily or monthly? Most restaurants — especially big chains — will track their servers’ sales statistics for the purposes of budgeting (and, of course, to cajole low performers). 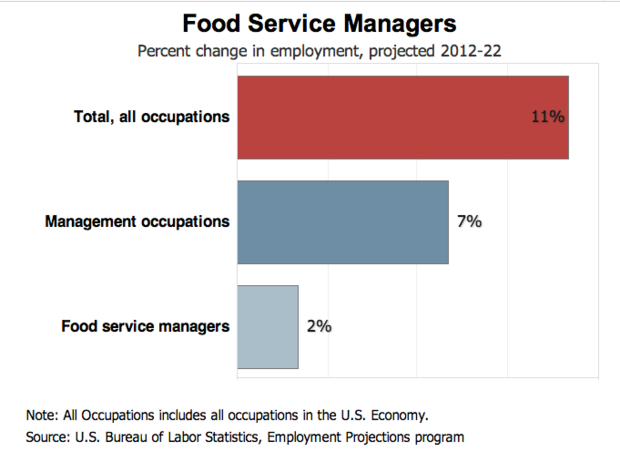 You can ask your manager to see these statistics, and include them on your resume. Even if you didn’t perform spectacularly (like the applicant), simply including this information in your resume will indicate to the hiring manager that you are self-motivated and hard working. This is called writing an “achievement oriented” resume — and these tend to land the most interviews. Here’s a step by step process for how to write an achievement oriented resume. Need more ideas? View the longest action verb list in the universe. Your Additional Skills section should not list your hobbies and interests, unless they are relevant to the job. Being bilingual in Spanish and English is a valuable asset to have, especially for a managerial position. If you also happen to be bilingual in Spanish and English, that also tends to be a valuable asset to have in a U.S. based restaurant — especially for a managerial position.